Bro. 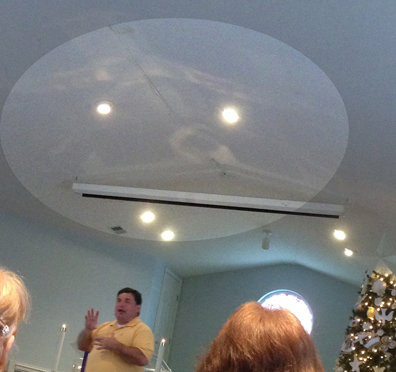 Ron began his Christmas message when we noticed a wonderful reflection on the ceiling above the altar. The reflection of light looks much like an angel with widespread wings looking down on Mary holding her new baby. 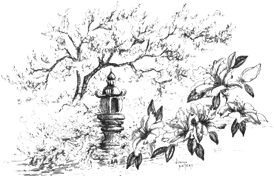 for help as we deal with life and death. Welcome to our “Chapel” site. Thanks for stopping by and looking at our church website. It is a joy to be part of a faith family that exists to serve and worship Almighty God. I have the privilege to pastor what I believe is an incredible group of people that really desire to be pleasing to God. Our goal is to do the best ministry that we can possibly do and allow the power of God’s presence to bring the results that will glorify His name. We are not perfect people but we do serve a Perfect God. Have you ever asked the question, “What are you doing?” The question is usually asked to question the motives or the actions of an individual. The answer of what we are doing and what we are called to do as believer’s in Jesus Christ is really a simple answer. The answer is number one- to Know Christ- this does not mean that I have heard about Him but do I know Him by having a relationship with him and this means the relationship is ongoing. I am still getting to know Him. The second part to this question is that I am making Him known by living out my relationship by letting God’s power live through me. God calls His people to serve others. If you have any questions or would like more information please feel free to email me. Thanks for stopping by and may God’s presence touch you today. This area is shared by anyone wishing to write and share their own words of inspiration. This is a great place to put your first writings. Let us celebrate them with you. To be a contributor to this feature, please send your copy to us as digital text. If you have any images to include, they can be sent in as well. My little boy stood close to my side in our new back yard in Houston, Texas. He would soon be attending a pre-school program where most of the children spoke Spanish. I was busy making our home comfortable before our new baby would arrive in a few short weeks. Everything in our lives was new and different. The grassy back yard was fenced to a back alley where generations before us had put their trash each week for pick up. but added another fence between neighbors making new friendships just a little more difficult. Making a new home so far from family and friends was a frightening and lonely task. A silver haired man came from nowhere to greet us. He had a quiet voice and warm smile. Mr. Weber would become a very important man in our lives, but on this warm spring day, he was a welcome visitor in this new world. He was a confirmed bachelor now in his golden years. Having lived with his Mom until her recent death, he now lived alone and worked as caregiver to others around him, especially the children. to help fill my growing families needs. A few days later he knocked at our back door with fabric and a pattern. He had taken a small neighborhood child named Tina out to shop for school clothes. Together they had picked out fabric and the right size pattern and offered to pay me for my making the small dress. Soon, I had the money for the paint remover and varnish needed for the little wardrobe and Tina had new dresses for school. Tina was a very quiet 6 year old child who beamed at the sight of her new clothes. The summer continued in much the same pattern. More furniture appeared and with it opportunities to earn a little money. I never learned much about Mr. Weber’s own life other than each new project he created to help others. I only saw his house and yard from the alley. Every inch was filled with salvaged goods of every sort. His talent for “re-purposing” things was wonderful. He seemed to have a small guidance system within his heart that told him when and where to save string, lumber and other well used items. His instinct to know when others were hurting or in need was as keen as his desire to help. The day Mr. Weber arrived with a package of fresh pork chops was the day I knew this special person was serving a higher existence. I gratefully accepted the gift and then he added 2 bright red tomatoes still warm from the Texas sun. Tonight’s meal was no longer a problem and I realized I was in good care. Those three years passed quickly. We now had my baby girl and our life in the new city was comfortable. The days were filled with a variety of projects that all seem to begin with a visit from Mr. Weber. The children began each day at the back fence looking for signs of our kind neighbor. A call from a friend at church asked if we could take in children who needed a temporary home while their family lives were sorted out. Not knowing how we would cover all the needs we offered to do what we could. Three young children soon arrived at our front door and we expanded our table and rooms to meet their needs. Once again Mr. Weber arrived with extra food from him backyard garden and everyone was fed. Extra clothing soon followed and were washed and put into use by the three special children. Looking back, I realize that time of our lives was lean compared to others. I never learned much about Mr. Weber’s life but he seemed to always be busy being a part of helping others. Money was not abundant, but the goods and services that filled the needs for so many other people was more than needed. The only limitation to delivering the many things to help others was just the time it took each day to make them happen. 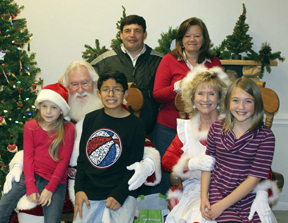 Mr. Weber had replaced needs with the desire to help others. Money was replaced with other resources. His power to help others had met no limits. He was wealthy beyond all earthly resources. When we are given the desire to help others, we are also given great resources. We have to be extremely wealthy in spirit to give to others. Learning to give is as simple as growing your own wealth. will arrive to fill the empty space in your own pantry. Accumulating personal stuff only makes us the caretaker of stuff. in a way that makes our heart fill with a greater and lasting joy. In Memory of Mr. Lynn Weber, a very wealthy man. we have attached the PDF version of each one shared here.